Woo hoo, I am finally healthy again. It took a while but I finally managed to shake the cold that I first caught about 3-4 weeks ago. With my new-found healthiness appears to have come a renewed vigour for life and an inspiration to do my very best at work, and on the blog over the coming weeks. I've also found a drive to get the nursery ready for the baby and finish off lots of jobs that I have been meaning to do for a long while. The other day when my cold was at it's worst, I started to really suffer with back pain. The pain was preventing me from sleeping and, as I mentioned before, I found that putting a memory-foam mattress topper on the bed seemed to ease the discomfort during the night. During the day I tried out a back-pain aid called PosturePlast. PosturePlast is effectively a great big sticking plaster which you apply to your back in such a way that it keeps your back in a safe posture. I've found that the times when I most experience pregnancy back pain in the day are when I am sitting at dining tables. 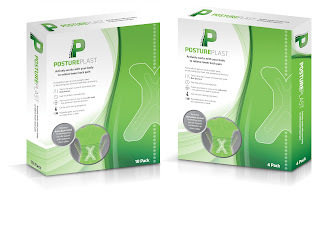 I found that I hardly noticed wearing the PosturePlast most of the day but when I was at the dining table, I was aware that it was pulling me into a position I was unused to - perhaps the position I should be in to prevent this bliming backache! It is designed to support the back and prevent you from injuring yourself by putting yourself into the wrong positions. I can't say that I found it to reduce my back pain, but I was aware of it correcting my posture and pulling against my back when I was walking. I also found the PosturePlast to be pretty tricky to put on - it was definitely a two-person job to apply it in the correct place on my back. PosturePlast is suitable for combatting many different types of back pain and is also recommended for new mums who are unused to carrying babies and car seats etc. Mary, Mary quite contrary do you shop on line? Nursing Tops and Cleanser - This is how I rock!